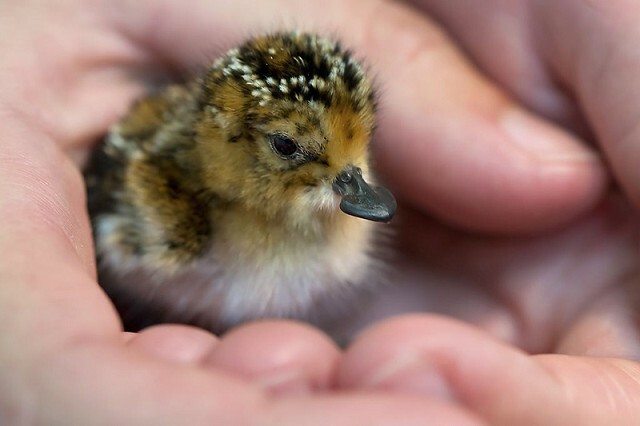 Fourteen Critically Endangered Spoon-billed Sandpipers were hatched in captivity at WWT Slimbridge Wetland Centre in Gloucestershire this week, a first for the UK and only the second flock ever to have been born in captivity. These latest chicks are part of an emergency conservation breeding mission to insure the species against imminent extinction in the wild. Four further eggs are expected to hatch in the coming days and, if successful, will bring the total flock size at Slimbridge to 30. The size of the flock is critical to triggering breeding behaviour in the birds, which are mature enough to reproduce at two years old. The birds were hatched from eggs taken from the tiny remaining wild population that breeds on the sub-Arctic tundra in the Russian Far East. They were flown by helicopter and plane on a week-long journey via Anadyr, Moscow and Heathrow before arriving at the Wildfowl & Wetlands Trust (WWT) at Slimbridge. WWT Head of Conservation Breeding, Nigel Jarrett, travelled with the eggs and is overseeing care for the tiny chicks, which hatched the size of bumblebees. He said: "The Spoon-billed Sandpiper is a beautiful and unique bird, but whatever it looked like we couldn't stand by while it went extinct. We hatched the first of our conservation breeding flock on the tundra last year and brought them back when full grown. With all we learned then, it made sense to transport them as eggs this year and the huge privilege for the UK is to have these amazing little chicks hatch here for the first time." 24-hour old Spoon-billed Sandpiper chick (WWT/Paul Marshall). The dramatic decline in Spoon-billed Sandpiper numbers was first observed in 2000. Now fewer than 100 pairs are thought to remain. Russian and international field workers travel each year to the breeding grounds in Chukotka to monitor numbers and have been critical in raising the alarm. 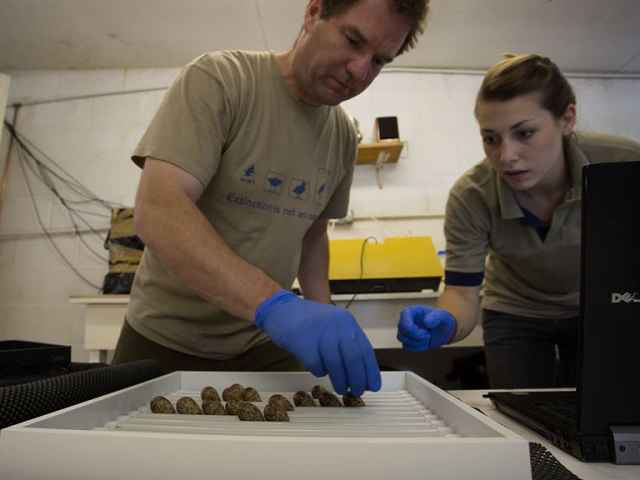 Dr Christoph Zockler led the expedition this summer to Meinypil'gino, the main breeding site. He said: "The number of pairs returning to Meinypil'gino dropped again this year to fewer than ten pairs. It is very worrying and reflects the wide-ranging conservation problems along the birds' flyway. We did have some good news, though. With more volunteer fieldworkers this year, we were able to search more remote areas away from the village for the first time and we found five further pairs." Although the long-term decline of the Spoon-billed Sandpiper is thought to have been driven by inter-tidal habitat loss in East Asia, the roots of the current problem have been identified some 8,000km away in coastal Myanmar and Bangladesh, where the birds spend the majority of the year outside the breeding season. Bird trapping by some villagers is suspected to have driven the steep decline in numbers. Local and international conservationists have had some success in stopping this practice by helping villagers find and fund alternative livelihoods. Once these threats have been tackled, birds from the conservation breeding programme will be returned to the wild to increase the remaining wild population. Evgeny Syroechkovskiy is Chief Executive of Birds Russia, and his studies of Spoon-billed Sandpipers in Chukotka have been central to the international call for action. He said: "To see these amazing birds almost disappear has been terrible. But we raised the alarm and people from around the world have responded. I hope that having these chicks — a little bit of Russia — in the UK encourages even more support for the Spoon-billed Sandpiper." WWT's Nigel Jarrett and Nicky Hiscock with Spoon-billed Sandpiper eggs (WWT/Sacha Dench). Dr Tim Stowe is Director of International Operations at the RSPB, the UK partner in the 117-nation-strong BirdLife International global partnership. He said: "This is a great example of organisations, experts and individuals from around the world working together to save an animal from extinction. A bird like the Spoon-billed Sandpiper, with its bizarre little beak, has survived through time and it doesn't deserve to be wiped out now. All elements of this project — from our work with subsistence hunters in Myanmar and Bangladesh, to efforts in Asia, where the birds' habitat is severely under threat, and the captive breeding programme here in the UK — will make sure future generations won't have to rely on pictures of a quirky little bird that once was but could have been saved if only we hadn't let them down." As well as support from conservation organisations around the world, individuals and institutions have been donating funds to support the Spoon-billed Sandpiper. Dr. Debbie Pain, Director of Conservation at WWT, said: "The level of support for the Spoon-billed Sandpiper has been phenomenal. It is only thanks to donations from thousands of individuals plus a major grant from SOS (Save Our Species), that we are able to put this emergency plan into action. But it is expensive work and we are still £50,000 short just for this year. I urge anyone who is taken by the Spoon-billed Sandpiper to make a donation, however small. The work that it will pay for will have benefits for millions of other birds besides." News on the efforts to save the Spoon-billed Sandpiper can be read at www.saving-spoon-billed-sandpiper.com or search for hashtag #sbs2012ex on Twitter.